WordPress Plugins Adopting Gutenberg — A Case Study Featuring Gravity Forms! Ever since Matt Mullenweg’s announcement about the new WordPress editor at State of the Word 2017, the community has been trying to assimilate the Gutenberg blocks. Till now people have shared different views — be it in the form of A Visit From St. Gutenberg or some long-form articles featuring the perks & pains of Gutenberg. Such reaction from the community is kind of natural. When WordPress means way more than just a piece of software to you then having such concerns is normal. But considering the competition which other CMSs offer, major updates to WordPress are crucial. Long story short, you love it or hate it, Gutenberg is coming! I believe this is what the Next WordPress will look like and as soon as it gets merged with the core, a lot of things in the WordPress community will start changing. Or will it be wrong if I say that the change is already there? 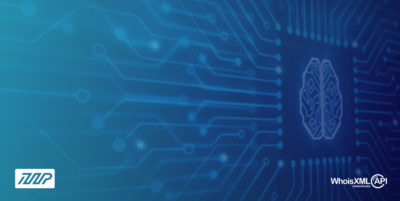 WordPress developers/agencies have geared their products towards Gutenberg compatibility and have started building a new niche which will feature a completely different set of WordPress themes, plugins, interaction, automation tools, site building, etc. Today, I will be reviewing how WordPress plugins are adopting Gutenberg and where it is leading!? For a case study, I will be talking about the development and compatibility of Gravity Forms with Gutenberg. Reason being, Carl Hancock — Co-founder of Gravity Forms — has been a keen advocate of Gutenberg in the right for the right reasons. As a result, Gravity Forms became one of the early adopters of Gutenberg. Currently, the Gutenberg version of Gravity Forms exists as an optional add-on. Their recent update is Gravity Forms Gutenberg v1.0 Beta 3 which is now available on the Downloads page. It will live as an add-on until WordPress 5.0 and we might see more changes and releases till then. ✅ 219 (25.44%) are compatible. ⚡️ 518 (60.16%) are likely compatible. 💥 25 (2.9%) are likely not compatible. ❌ 39 (4.53%) are not compatible. 🔥 60 (6.97%) are in “testing”, which means someone started a test and abandoned the process. Looking at the results are pretty promising and it’s good to see how the community is adopting change. However, the plugins might undergo major changes and releases as Gutenberg gets future updates. This could be the reason why other plugins are still waiting for Gutenberg beta release before they finally join the league. However, check out the awesome Gutenberg Compatibility Project by Daniel Bachhuber. He’s looking for volunteers to test the plugins and help him out. So, if you have got some time maybe go help him test a few plugins. As the developer of a major WordPress plugin, Gravity Forms, we intend on fully embracing Gutenberg. We will be introducing all kinds of new features and functionality as a result. 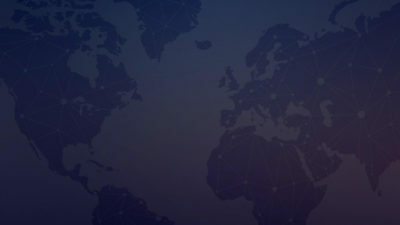 In early February 2018, they launched the first beta version of Gravity Forms as an add-on to their current stable release. At the time of writing this article, they’ve released the 4th beta version of their Gutenberg add-on which shows the commitment and passion of Gravity Forms team towards Gutenberg. The first release was kind of a major overhaul of Gravity Forms. It included support from Gravity Forms blocks, conditional logic, legacy shortcodes support, and reusable blocks. Till then they’ve merged a number of pull requests, solved issues, and improved on their work. Right now, it supports MailChimp add-on and support for other add-ons is coming soon. Now, let us jump in and see how Gravity Forms work with Gutenberg. We’ll also take a look at the MailChimp integration of Gravity Forms in Gutenberg. Make sure you’ve got the Gravity Forms license before you actually try to check it out. 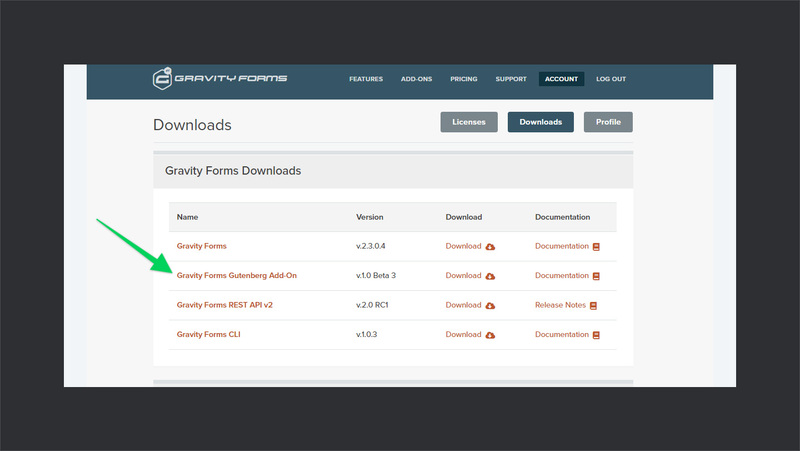 Also, check out our extensive review of Gravity Forms to get started with add-ons. Now, make sure that you have the latest version of Gravity Forms installed. The very first step is to download and install the Gutenberg add-on for Gravity Forms. Let me save you from inconvenience since currently, it’s not available in the add-ons section. Rather you can find it in the downloads section of your account. Alternatively, hit this downloads page link to grab your copy. After downloading the plugin, go to the plugins section from your WordPress dashboard, install, and activate it. Make sure you’ve installed and activated the Gutenberg plugin for WordPress. 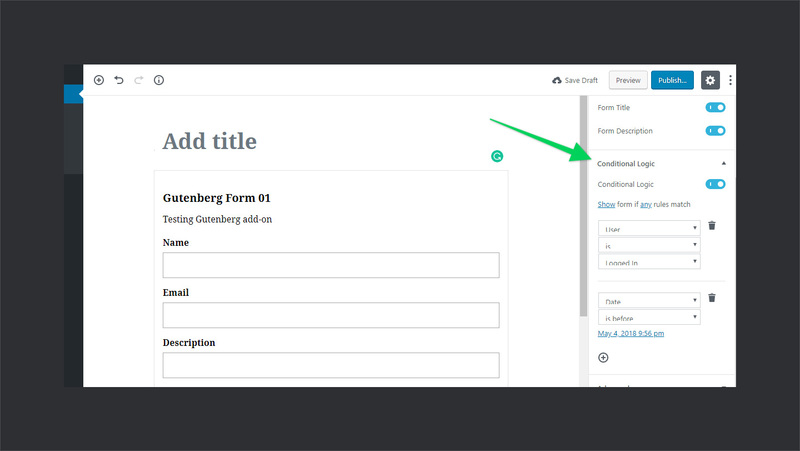 Now, in order to display the forms in the Gutenberg editor, you first have to create them. So, go ahead and make some forms using Gravity Forms. Next step is to actually start embedding the Gravity Forms blocks. Create a new page or post, go to the embed section, and select Gravity Forms. Then from the block, select the form that you want to display. And you’re good to go! So, you can create kind of dynamic blocks this way. Which may show up for some users and hide from others. That’s probably how the next generation websites might shape up. And probably that’s what Chris Lema says when he talks about Gutenberg & WordPress. Primitively, Gravity Forms generates a shortcode based on the form ID. When you insert a form in the editor, you actually insert a shortcode of the form. And the best part is, Gravity Forms blocks support those shortcodes. You can simply paste the code in the paragraph block and it will be converted into a Gravity Forms block. In the 3rd beta release of Gravity Forms blocks, they introduced their first add-on block — MailChimp + Gravity Forms block. All you need to do is to create a campaign on MailChimp, install MailChimp add-on on Gravity Forms, and you’re done! It will add a block namely — Mail Chimp — in the blocks list where you can use it easily. 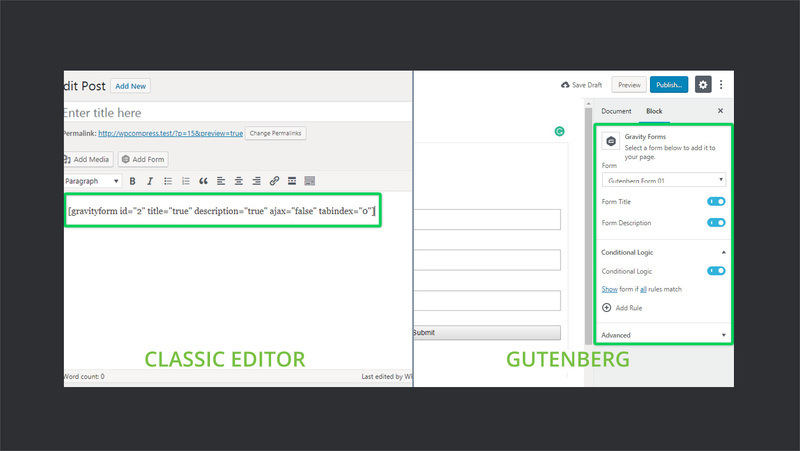 Now, if we compare the experience of adding a Gravity Form in Gutenberg vs classic editor, I would definitely go for the Gutenberg one. There are a couple of reasons for it and they’re not just limited to the Gravity Forms. 👉🏻 The very first one is, when I will have a couple of plugins installed, they won’t simply stack up on the editor. Instead, they’ll be organized into their block sections and I can easily pick up the desired one. It will result in a consistent UI and user experience. Also, the search box in the blocks section would further help improve the experience. 👌 The second thing is, while dealing with shortcodes in the classic editor, you had to select a shortcode, add some custom fields, and insert it. And to change some options, you had to do it manually. Also, you didn’t always have the preview. Now, consider just selecting the item from the block, with preview, and managing all those options from the sidebar!?  🎖 Last but not least, is the concept of reusable blocks. It’s kind of inserting a block, let’s say from a shortcode, then changing its settings and saving it for re-use. I mean, blocks out of blocks. And who knows how much more possibilities Gutenberg might bring when it finally comes out. I believe Gutenberg will prove to be a great decision for the betterment of WordPress as a CMS and its community as a whole. On one hand, it will help WordPress maintain its status and grow, while on the other hand, it comes as an opportunity for WordPress Developers to diversify their skill set. It might result in more adoption of WordPress and better job prospectives for the developers. 💎 Ahmad Awais has been a Gutenberg evangelist since its early days. First, he developed Gutenberg Boilerplate for WordPress Plugins and now his zero-config Create Guten Block toolkit is a gem. It allows you to create Gutenberg plugins without worrying about configuration or anything else. If you’ve not tried it yet, you must check it out. Apart from this, there’s a lot of interesting stuff going on regarding Gutenberg in the WordPress community.  Yoast has also published their roadmap for Gutenberg integration. GiveWP is already on the way to Gutenberg adoption. We are seeing more and more plugins jumping into this ecosystem with the development of Gutenberg. That’s all pretty much awesome to see — WordPress community embracing Gutenberg. What are your thoughts on Gutenberg? What’s your plan for moving on to Gutenberg or how you plan to cope up with this update? Let’s know your thoughts in the comments below! When I first saw the title, I was thinking about building forms in GF right in the Gutenberg editor. Seems like I expected too much! I think the current integration is good, but not really great. It’s like previewing the form / shortcode only and users can’t edit the form right in the Gutenberg. I think Jetpack’s contact module does the job better in this situation. I hope GF can be improved in the future, cause it’s the best contact form plugin I’ve ever used! Yes, I think the Gravity Forms team would be building something similar or even better. 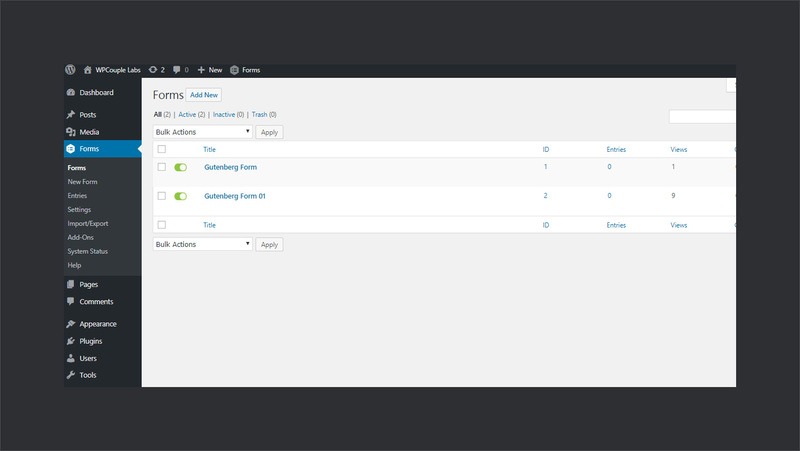 Updating the UI of a free single UI contact form is easier as compared to a huge plugin that is meant only for Forms. Also, Gutenberg hasn’t released yet. Safe to say, I am expecting the same as you are. Are all configured forms shown in block or only those who belong to current user? Show stopper for us, if all are shown.